Ray specializes in creating campus master plans, designing new buildings, and providing solutions for complicated renovations. He sees the process of design as being collaborative, transparent, integrated, and constantly evolving from project to project. Ray brings energy and enthusiasm to the design process and believes that listening and clearly understanding the design problem creates a strong point of departure for creative and artistic solutions. He transformed an abandoned Canadian Department of National Defense base into a new university campus. The new campus in Chilliwack, BC for the University of the Fraser Valley was awarded the 2013 WAN (World Architecture News), Best in Class for University Buildings. 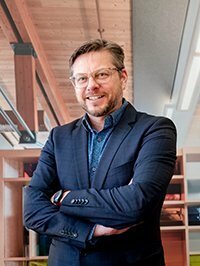 For Ray, the challenge of designing extraordinary, student-centered spaces brings focus to all of his projects—whether working for a student union or designing state of the art campuses.